"...navy blue silk or bunting, with the seal of the Commonwealth of Kentucky encircled by a wreath of goldenrod, embroidered, printed or stamped on the center thereof." Dimensions of the flag were not specified but were allowed to vary. Evidently, the law was not specific enough to produce a satisfactory flag, but it wasn�t until 1962 that this was remedied. In 1917, the U.S. War Department selected Louisville as the site for a huge military camp. Camp Zachary Taylor, a training camp for soldiers heading off to the Great War (World War I), opened 90 days later. 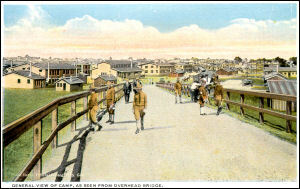 It was one of sixteen national army camps in the U.S. Camp Zachary Taylor trained over 125,000 men during World War I. It was closed in 1920, after the war. The first State flag was made in 1920 for a ceremony at Camp Zachary before the property was sold. Nobody was pleased with the flag and, after the ceremony, a committee was formed to review it and offer suggestions for improvement. Unfortunately, the work of the committee was lost or forgotten on its way to the Governor for his approval. The Camp Zachary flag eventually ended up in the custody of the Kentucky Historical Society in Frankfort. It was several years before the issue of a State flag was addressed again. Governor Flem D. Sampson was sworn in as Governor of Kentucky in 1927. The forgotten State flag was required for another military ceremony. Without reference to the early committee work, the Secretary of the Kentucky Historical Society, Jouett Cannon commissioned Frankfort art teacher, Jesse Cox Burgess to provide the design work from which a State flag could be fashioned. Three flags were made from Burgess� ink and oil artwork by a Philadelphia company. Only two of these flags ever made it back to Frankfort however. The other was lost during use in a Chicago ceremony. In 1961, Kentucky Adjutant General, Major Taylor L. Davidson launched a project to codify a specific design for Kentucky�s flag. In the interest of finalizing the flag design, research was completed on the history and design of the earlier State flags and artist Harold Collins produced three color designs that were presented to Governor Bert T. Combs for his approval. Once Governor Combs had selected a design, a template was created and a detailed bill was drawn up by Major Davidson for introduction in the Kentucky Legislature. To eliminate future uncertainties about the design, detailed drawings were included with the bill. In 1962, these amendments to the 1918 law were adopted by the Kentucky Legislature, going into effect on June 14, 1962. "Amend KRS 2.030 to permit, rather than require, that the emblem of a Kentucky cardinal be at the head of a flagstaff used to display the state flag." The amendment changed the word "shall" in 2.030, section 3, was changed to "may." House Bill No. 743 died in committee. The Kentucky State flag, longer than other State flags, displays a rendition of the Seal of the Commonwealth centered on a field of blue. The following information was excerpted from the Kentucky Code , Title 1, Chapter 4. (1) The official state flag of the Commonwealth of Kentucky shall be of navy blue silk, nylon, wool or cotton bunting, or some other suitable material, with the seal of the Commonwealth encircled by a wreath, the lower half of which shall be goldenrod in bloom and the upper half the words "Commonwealth of Kentucky," embroidered, printed, painted, or stamped on the center thereof. The dimensions of the flag may vary, but the length shall be one and nine-tenths (1 9/10) times the width and the diameter of the seal and encirclement shall be approximately two-thirds (2/3) the width of the flag. (2) The approved official drawings of the state flag shall be permanently retained in the files of the office of the Secretary of State. All state flags for official use of the Commonwealth shall conform as to color and design with these official drawings. (3) The emblem at the head of a flagstaff used to display the flag of the Commonwealth of Kentucky shall be the Kentucky cardinal in an alert but restful pose, cast in bronze, brass, or other suitable material. (4) The flying of the state flag at all state buildings and installations including public school buildings, National Guard armories, state parks, and other such buildings is considered proper and is encouraged. (5) No disrespect should be shown to the flag of the Commonwealth of Kentucky. With the exception of the flag of the United States of America, the flag of the Commonwealth of Kentucky should not be dipped to any person or thing. The flag should never touch anything beneath it, such as the ground, the floor, water, or merchandise. The flag, when it is in such condition that it is no longer a fitting emblem for display, should be destroyed in a dignified way, preferably by burning. History: Amended 2002 Ky. Acts ch. 196, sec. 1, effective July 15, 2002. -- Amended 1962 Ky. Acts ch. 114, secs. 1, 2, 3, and 4, effective June 14, 1962. -- Recodified 1942 Ky. Acts ch. 208, sec. 1, effective October 1, 1942, from Ky. Stat. sec. 4618m. 2.035 Pledge of allegiance to state flag. The following shall be the official pledge of allegiance to the flag of the Commonwealth of Kentucky: "I pledge allegiance to the Kentucky flag, and to the Sovereign State for which it stands, one Commonwealth, blessed with diversity, natural wealth, beauty, and grace from on High." History: Created 2000 Ky. Acts ch. 206, sec. 1, effective July 14, 2000. Source: Kentucky Legislature, Kentucky Revised Statutes, , August 12, 2007. Source: The Kentucky Department for Libraries and Archives, Kentucky's State Flag, , August 12, 2007. Source: Camp Zachary Taylor Historical Society, Camp Zachary Taylor, , August 12, 2007. Kentucky's State Flag: from The Kentucky Department for Libraries and Archives. Kentucky (U.S.): FOTW "Flags of the World" Web Site.